So I am in the process of creating a server on discord to use with my twitch. A few days ago I added Nightbot and since then it has gone offline. Now it is unusable and in the Integrations settings on Nightbot’s website it keeps giving me the error message “internal server error” when I try to have it rejoin the server. This has been a problem in the past I saw on sever other posts. I have tried the solutions shown in other answers but it doesn’t seem to be working. I have kicked (not banned) Nightbot and had it rejoin and it gives the same error repeatedly. Any suggestions? Is it possible that another bot on the server is interfering with it such as Muxy? Thank you in advance. This should be fixed again for the moment. This error happens when Discord resets the bot’s token due to too many disconnects. I think you might be thinking of something else. You see I can’t even get the bot to come online. Bot joins the server but then goes offline (this is a discord server). Same here for both the server i run and another server i admin on. We can’t keep the bot online and we use it extensively in our discords. I’ve been having this same issue for the last few weeks. I barely got Nightbot to reconnect after multiple Internal Server Errors yesterday. Nightbot seemed fine and online. 0 commands recognized, and now Nightbot is offline. This is what happens everytime the bot goes down on discord. I’ve disconnected nightbot completely, cleared cache and data, and then reconnected everything every day for the last week straight trying to hope that things fix themselves between discord and nightbot, and intermittently the previous two weeks. I have the exact same screen right now. I was able to get nightbot back online but it wasn’t performing any of the roles assignments it should have and now it is back offline. I’m having this issue as well. I have Nightbot in two Discord servers, but it has remained offline the last few days. When checking my Discord integration, it said that Nightbot had been kicked, although it was still a member of both servers. I tried re-adding it to the servers, but it pops up with an “internal server error.” Now Nightbot’s not even showing that it’s a part of my servers, even though it’s still a member of both. I even kicked Discord from a server and tried to re-add it with the same issue. It did re-add him as a member of the server, but shows no connection on the Nightbot website. I also have this issue. Was working fine few days ago, but can no longer do any commands and Nightbot shows as offline for me. This Error is still active, someone please fix it! NightDev is having to rebuild Nightbot completely because the stability has reached its end point. They will let you know when Nightbot will be active once again. Discord at first was just too much for the little guy and he was topped off with a lot more sites and apps as well, causing him to burn out of balance. So, they’re working hard to get him working again. is there any eta on the fix? 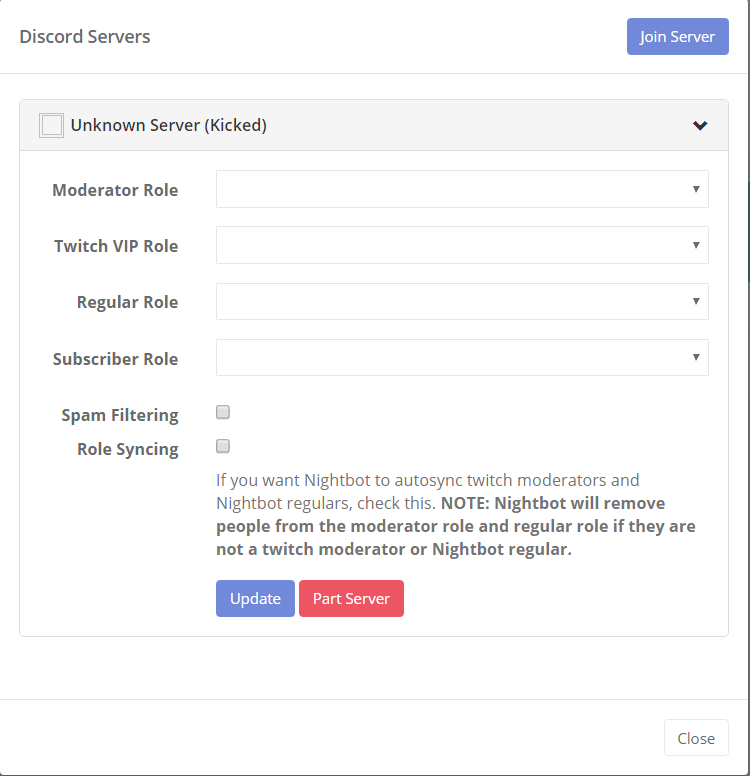 We released an updated version of Nightbot for Discord which rebuilt a lot of the internals, so it should be operating more reliably. There could be some latent issues while we iron out remaining bugs, but things are looking much improved compared to before.